Today I'm drinking Hopslam Ale brewed by Bell's Brewery in Comstock, Michigan. Yes, it's that time of year again when Bell's sends three cases of this beer to each local Total Wine store and the impending hype rattles on for months. I first tried this beer last year and certainly thought it was a great beer. So $20 for a sixer instead of the $17 from last year seems fair, right? This better Rock the Casbah! 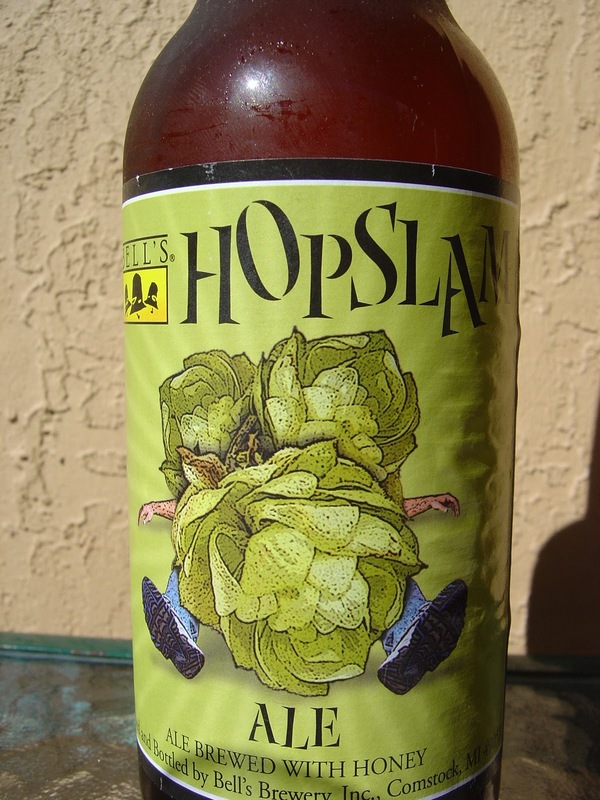 The label is mostly green, but you can see what appears to be the shoes and arms of a guy who got crushed by 3 giant hop buds right on the front. The bottle cap repeats that picture. 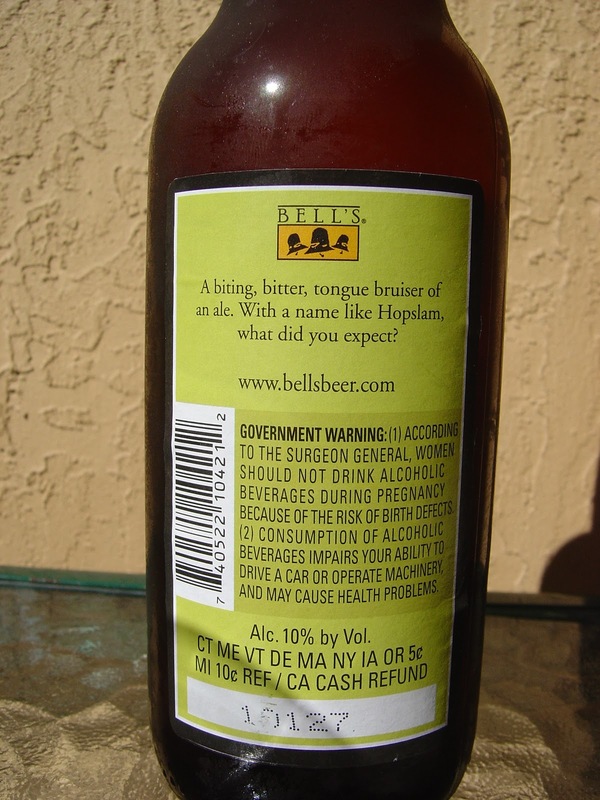 The back of the bottle states, "A biting, bitter, tongue bruiser of an ale. 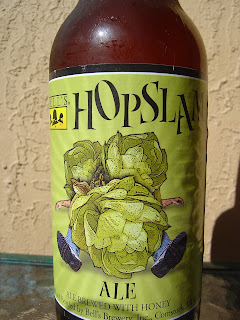 With a name like Hopslam, what did you expect?" This beer was brewed with honey. Batch 10127. One last comment. For $20 and for one of their signature beers, Bell's should be able to put the neck label on straight. Ten degrees off center and ten degrees crooked are both gift estimates. Beautiful hoppy citrus and tropical fruit aroma. Peaches, papayas and pineapples... Oh My! Sweet tropical fruits are the first flavors to hit your palate. Oranges and peaches are standouts! 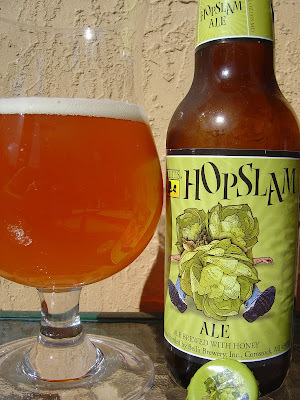 Some hoppy pine bitterness coupled with a small dose of spice come in for a balancing challenge, but honey then gets tag-teamed into the ring and body slams any further bittering effect. Basically, this is like drinking a sweet flower. Hmmm. Creamy texture, nice carbonation, oily and slightly syrupy body. The 10% alcohol was mostly masked though it did cut through the sweetness quite a bit and provided a very dry finish. You are left with a nice fruity aftertaste. Over-hyped? Damn straight! Delicious? Absolutely. Once a year I will probably continue to make sure I get a taste of this beer, even at the current rate!